Eternal Starling really well written and just super fun to read, and even pretty suspenseful. After Evie meets a boy named Alex, things get pretty crazy in her life and she has no idea what's happening, just as we have no idea what's happening. It was great to see everything unfold and Evie did, and learn what was going on as she did. The plot and pacing were great, not too slow, but not too fast either. A concept like this needs the proper amount of time to build everything up and explain it all, and Angela did just that. You may be confused at first, but everything is eventually revealed. This is honestly the first time that I've ever read a book with a love triangle and I just can't pick a team! I can always gravitate more towards one boy, but in Eternal Starling, they were both so amazing for different reasons! Alex and Emil each have to equal parts of my heart at the moment, just like Evie, and only time will tell which one of them is the winner of the whole thing. The only thing I didn't like about Evie's relationship with either of them is that, in both instances, it was a bit of insta-love. But, I'm usually not such a stickler for that in reincarnation stories because technically, they knew each other more than they actually did, so it's not that bad. I really liked Angela's writing style, it gave Evie real depth and personality. Since it's told from her perspective, we only see things as they happen to her and what she thinks of them. Angela's style was realistic and pretty funny at times. I can't wait for the sequel, and I'm glad that there's going to be more books in the series. I'm definitely a fan of this series. Great debut! 4 out of 5 stars. 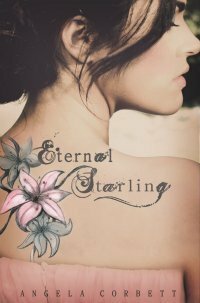 I have a signed cover jacket and bookmark for Eternal Starling up for grabs! Ooh, that cover is so subtly gorgeous! If someone told me they were my soulmate (and they were a complete stranger) I would give them a chance to explain before I slowly walked away. I don't know how I would react if someone told me they were my soulmate. I would be shocked at first and think their crazy. Then I would go home and overthink about everything that has happened in "our relationship." If someone told me that at this point - I think I'd laugh. Really hard and a lot. Maybe that's mean, but I'd definitely think it was some sort of personal or cosmic joke. Wow, this book sounds like an intense, good read! If someone told me that I was their soul mate I would be THRILLED. Come on, fellas! What are you waiting for?! Haha. That depends on the person ;D But I probably wouldn't beleive them because c'mon! As much as each of us would love to meet our soul mates, it would be too easy, weird and not exciting if someone just came up to you and sai "Hi! I'm your soulmate :D" Thanks for the cool giveaway! i would sort of freak out of first but I might turn out to love him it would be okay. I always wondered about this and always sort of wished that's how I had met my significant other. Didn't happen that way but I'm happy anyways. I think if it had happened that way I would have been thrilled. I have know idea how I would react if someone told me they were my soulmate. Confuzzled, maybe? I can't wait to read this book. It looks amazing! Thanks for the giveaway!! I think if someone told me that they were my soulmate, i would freak out! I mean, dude how do you know? Anyway, as for the question...if it were someone who I had already been interested in, I'd be like heck yes! If it were just some random person or someone who I didn't know very well, I'd be a little freaked out. To be honest I have no idea, I would probably be speechless or think they were crazy! I would be speechless but that would definitely get my attention and I would want to get to know them a lot better.